I went with purple & grey for something different and striking on these Westfalia halfling samples. I still need to decide on a symbol/blazon/device/badge/whatever-you-call-it for the standard and possibly on other figures in the future. So they're still just 98% finished. My fondness for this range of figures just keeps growing. They look nice in photos online, but they are even better in person. The proportions, the crispness & detail, the poses, the concepts -- all awesome. On the one hand, I'm looking forward to the Kickstarter, but on the other I've got to come up with some money to pledge towards it. I think I'm going be digging through my existing collection to sell off some stuff to fund a shedload of halflings. 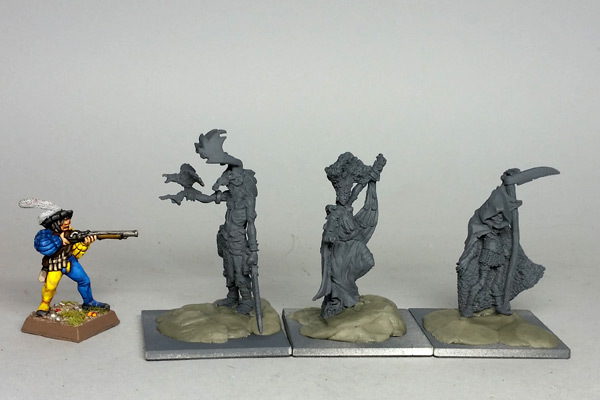 While waiting for putty to cure on another project, I cleaned up some recently stripped Oldhammer figures, and took the plunge and assembled the Lord of the Feast. I ended up covering the awful arm joint with a band of putty. That should help reinforce it too, since I didn't pin it. My thought is that the Lord of the Feast will join the Life & Death elementals in their old rolls in Warhammer, as "daemons," or lesser avatars of various gods. I'm looking forward to seeing how you paint up those daemons too, as I've not seen many completed examples. Love your stunning halflings, excellent job! Beautiful brushwork on the cool figures. 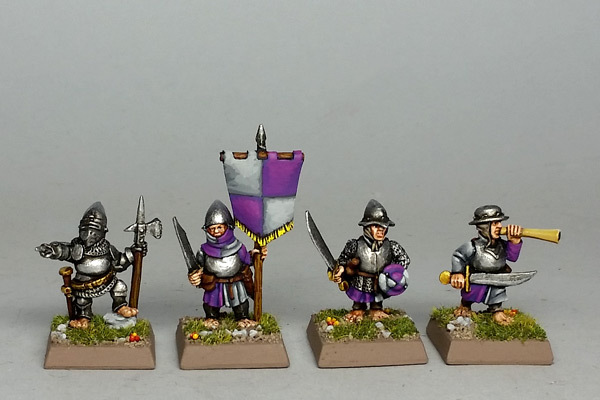 They'd be great for a Lion Rampant retinue. The colours and lines on those halflings are so crisp! I can't wait to see what you do with the Life and Death Elementals (that Death Elemental is one of my favourite sculpts). The entire range of elementals are among my favorite old Citadel models. I've still got fire, water, air, and earth painted up from ages ago, these two, and I just found the plague elemental and dropped it in the stripper for a repaint too. So soon I hope to have the complete set painted up again.